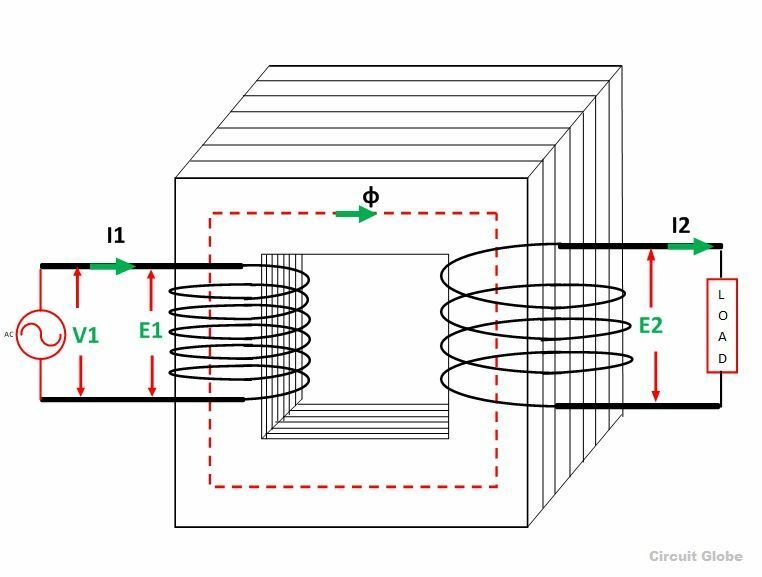 The basic principle on which the transformer works is Faraday’s Law of Electromagnetic Induction or mutual induction between the two coils. The working of the transformer is explained below. The transformer consists of two separate windings placed over the laminated silicon steel core. The winding to which AC supply is connected is called primary winding and to which load is connected is called secondary winding as shown in the figure below. It works on the alternating current only because an alternating flux is required for mutual induction between the two windings. Physically, there is no electrical connection between the two windings, but they are magnetically connected. 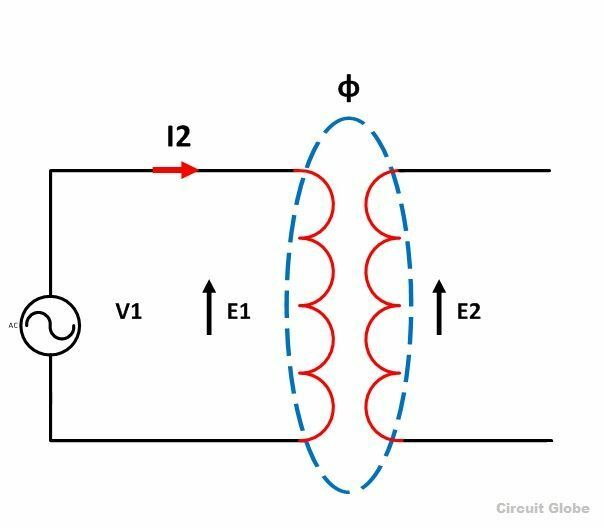 Therefore, the electrical power is transferred from the primary circuit to the secondary circuit through mutual inductance. The induced emf in the primary and secondary windings depends upon the rate of change of flux linkage that is (N dϕ/dt). dϕ/dt is the change of flux and is same for both the primary and secondary windings. The induced emf E1 in the primary winding is proportional to the number of turns N1 of the primary windings (E1 ∞ N1). Similarly induced emf in the secondary winding is proportional to the number of turns on the secondary side. (E2 ∞ N2). As discussed above, the transformer works on AC supply, and it cannot work not DC supply. If the rated DC voltage is applied across the primary winding, a constant magnitude flux will set up in the core of the transformer and hence there will not be any self-induced emf generation, as for the linkage of flux with the secondary winding there must be an alternating flux required and not a constant flux. The resistance of the primary winding is very low, and the primary current is high. So this current is much higher than the rated full load primary winding current. Hence, as a result, the amount of heat produced will be greater and therefore, eddy current loss (I2R) loss will be more. Because of this, the insulations of the primary windings will get burnt, and the transformer will be damaged. It is defined as the ratio of primary to secondary turns. The transformation ratio is defined as the ratio of the secondary voltage to the primary voltage. It is denoted by K.